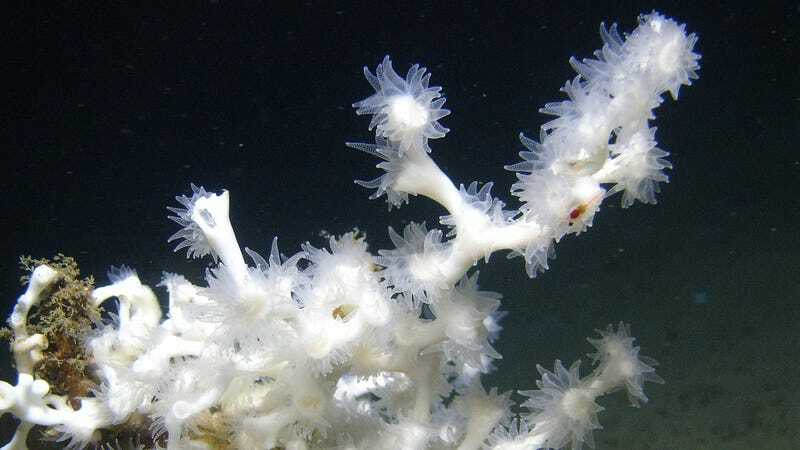 In the inky depths of the Gulf of Mexico, pearly white corals crisscross the seafloor, their translucent tentacles swaying to the current like flower petals on a midnight breeze. Lophelia pertusa brings life to what is often considered a cold, dead wasteland—and now, scientists are now bringing it back to the surface in the hopes that it help can restore dying coral reefs worldwide. The hour-long film, which follows a 2014 research expedition into the Gulf of Mexico led by Temple University deep-sea biologist Erik Cordes, is a raw, real look at how science gets done. It juxtaposes the lofty ideas that drive scientists to plunge thousands of feet beneath the waves in metal cans (discovering the unknown! saving humanity! ), with the seemingly endless barrage of technical difficulties that are part and parcel of field work. Ultimately, it’s an uplifting tale, which is rare in an age when most news about corals centers on death and destruction. Through a series of harrowing dives with the famed Alvin submersible, Cordes and his companions are able to collect samples of Lophelia and bring it back to the surface intact. And through subsequent lab work—subjecting the corals to a battery of tests to determine their acid tolerance—they find the “super coral” they are looking for. “But it gives us the hope there’s enough genetic variability out there that corals, in general, will make it through the worst of our effects,” Cordes told Earther. “And if we can unlock the secret to how the deepwater corals are doing this, there’s a lot of selective breeding and transplanting of corals starting to happen in shallow water” that could potentially benefit. Update 11/25: Earther was originally informed that the cruise presented in the film took place in 2010. After publication the filmmakers clarified that it actually occurred in 2014. The article has been updated accordingly.